A teetering stack of games finally toppled in my son's closet. I couldn't wait one more minute to deal with the drifts of toys now scattered over the floor. My first move was to condense the packaging as much as possible. I cut the picture from each puzzle box and bagged it with the matching pieces. Now we have 20 puzzles that fit into a shoebox-sized space. 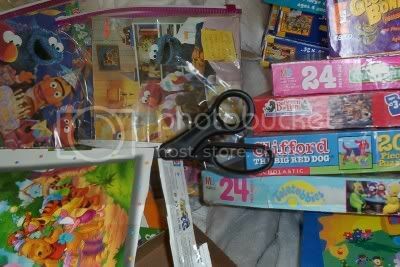 But, as an aside, when my son first say me doing it, he let me know that I had just depreciated their collecting value but mutilating the boxes. Someone's been watching too much Roadshow. When my kids were young, they would always get their puzzles mixed up too. So we packaged them the same way you did, but we numbered each puzzle. Puzzle #1 was written on the back of the picture and then we put a 1 on the back of each puzzle piece. It was tedious at first, but helped in the long run. That is a great idea for the puzzles. I haven't done that one yet,but I do a similar thing with board games. You know the ones that have a playing board and just a few pieces, but have a huge cardboard box? Like the game Sorry for instance. Besides the fact that the cardboard boxes get stepped on and/or fall apart so easily, they take up too much room, just like puzzles. So, I put all the boards into a plastic box/tote and all the pieces for each game and instructions into either a small plastic box or a ziplock bag and label what game they go to. Then keep the game piece box/bag in with the boards. That way everything is in one place, you don't have to contend with the crummy cardboard boxes and everything stored inside just one plastic box (or tote) is so much more tidy and neat looking in the closet! Anon, I'm still planning to post something about making a "man room" in your home. I'm only waiting for my husband to clear the stacks of dissertation research from his OWN "man room" so I can take a decent photo first! I have strict orders not to touch the piles until then. I did this several years ago with our games and puzzles and it really saves on storage space. Plus, it's a pain to constantly mend torn and broken boxes.